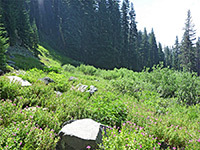 At just 0.4 miles (round trip), the Castle Crest Wildflower Trail is one of the shortest hikes in Crater Lake National Park, and is easily accessed, being close to the highway junction near the park headquarters. 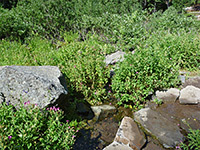 The path loops around a meadow containing many small springs, towards the upper end of the valley of Munson Creek, right at the foot of the steep slopes around the crater rim; like many other springs in the park, the waters originate via seepage, from the lake. Enough is produced for a sizeable, year-round stream to flow from the meadow, which is enclosed by tall fir and hemlock trees. 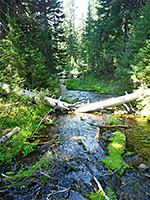 About half the trail follows the stream, while the reminder is a little higher up, close to the springs, and although short, the hike encounters mixed environments, of wet meadow, dry meadow, riparian (streamside), and dry woodland. This diversity accounts for the large number of different plant species that may be found here - up to 200 according to a trailhead guide, though only around 30 are common. The most visible types include American bistort, Columbian monkshood, crimson columbine, subalpine fleabane, western mountain aster, Lewis' monkeyflower, common monkeyflower, and one or more species of arnica and lupine. The trail was built in 1929, accompanied by planting of other native wildflowers to complement the species found here naturally. Wildflowers of Crater Lake National Park. The Castle Crest Trail can be reached by a 0.4 mile connecting path from the park headquarters, but most people start from the main trailhead, along the East Rim Drive. This is a popular location served by quite a large parking area, often full by lunchtime. 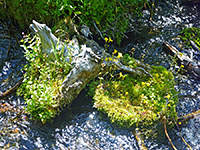 Anticlockwise is the recommended direction; the trail starts through a thin belt of woodland, crosses the stream on a wooden bridge then turns north, climbing gently out of the woods and into a large boggy area with many little seeps and springs, which are found all along the base of the steep slopes below the crater rim. Near the far side of the meadow, the trail moves through bushier surroundings, across the wet section using flat stepping stones, then returns past generally drier surroundings, coming close to the stream again at the end. Short loop around a boggy, tree-lined meadow containing springs and a stream, at the foot of the crater rim; home to many wildflower species.